One of many gaps in my early musical education was good ear training, something I'm now working on fixing. Real tone-deafness is rare, so unless you've actually been tested for it the odds are that if you can't pick out a major from a minor seventh it's because you haven't had enough practice doing it. Fortunately there are now lots of resources you can use to get that practice, so here's a quick round-up of things you can do in Fedora, with a little foray into looping for phrase training. First is online ear training, Musictheory.net exercises is a good resource which will require Flash support. They have a large selection of customisable exercises (notice a pop-up keyboard at the top right if you need it) and also theory lessons. The format for exercises is that the interval (or chord or note) plays and you then click the correct response, you can replay the example if you're not sure. Lots of resources, though I'm not too keen on the synthesiser sound it uses for the exercises. 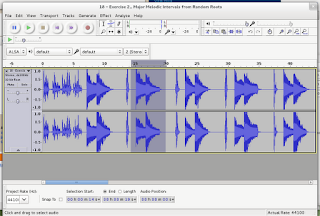 But you don't need to be online to use random interval training: GNU Solfege is available in Fedora via the add/remove software tool (or yum if you prefer). GNU Solfege provides a number of configuration options, you can change the instrument it's using and from the front page you pick a class of exercise (e.g. melodic intervals) and then the subtype (e.g. fourths, fifths and octaves). It's not quite as flexible as the Musictheory.net system as, if the particular selection you want isn't there (e.g. all intervals less than an octave), then you'll need to write it yourself; see the extending solfege section of the manual. One interesting thing Solfege does have is the ability to use use a different layout for your answers. If you want, instead of having buttons 'major third', 'major fifth' and so on, it can show you a picture of an instrument (including guitar fretboard and piano keyboard) which you click in the correct place to answer. At the moment I'm not using either of these. 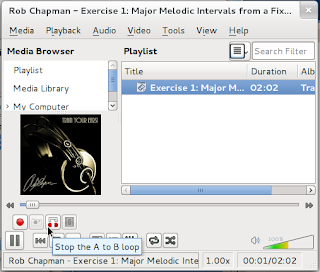 I'm listening to Rob Chapman's 'Train Your Ears' CD (downloaded from the Amazon store actually, unlike iTunes the Amazon music store works with Linux). Most of the CD is made up of listening exercises like those the programs above will play you (I just happen to find it easier to listen to a real instrument and don't like pushing buttons, though it also gives you a few ideas for getting started). But there's a problem: you get about a second between the example and the answer. What if you need longer? What if you want to hear it again? This is where I sneak a bit about looping and phrase training into this post. I've found two approaches that will work better than hitting pause in Rhythmbox and trying to get the progress bar back to the right place. As a bonus both will also work for anything else you need to be able to replay short sections of and start-stop, such as language tapes. Audacity will let you see the different sections. Arguably Audacity is the most flexible of the two options. You can install it from the Fedora software manager, but if you want to use MP3 files then you'll need to enable RPMFusion and install the Audacity-freeworld package instead. As you can see in the screenshot (in which I've zoomed in on the track a little) you can see the loud and quiet sections, which lets you easily select the region you want. You can then play a loop over your selection by pressing shift-space and space to stop. Pressing space will play through your selection just once. To play on you'll next to either extend the selection (drag its right side further along) or drop it or create a new selection. In this case maybe drag it to the short burst (the answer) before the next example. Then select the next example, shift-space and it will play over it again. For this purpose Audacity's waveform display also makes it easy to select an example at random. You can use the same thing if you want to listen to language examples or a particular piece of music you're trying to learn. Audacity also has a good trick if you want to use it for music, if you open the Effect menu you can select "Change Tempo", this will let you slow a section (or the whole file) down without changing pitch. The results don't sound fantastic (it seems to do very short section looping), but it can be a useful tool. To install VLC you'll need to enable RPMFusion. 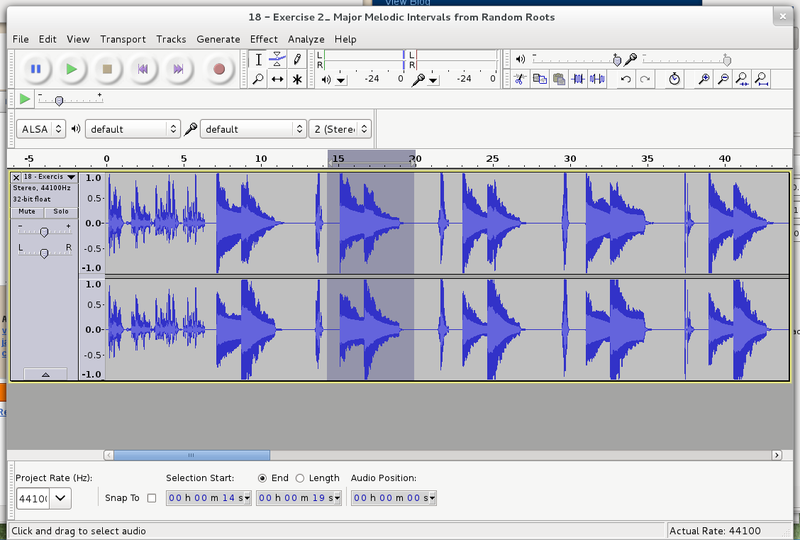 While VLC is missing some of the advantages of Audacity (seeing where each example is and fine control of the start and stop locations), there's less fiddling with selections involved. Just start playing, click the A-B loop button to mark the loop start, click A-B loop again to mark the loop end and the playback will loop over this section until you click A-B loop a third time which breaks the loop and carries on playing. Two things to note: the loop button is grey when not being used and you can pause while in a loop (if you need to stop and do something else without looped playback driving you insane). Again this works for anything else you need to loop, VLCVLC also supports playlists, unlike Audacity. That's it, obviously there are other (and more sophisticated) options which you may need to investigate if you want to do things like multi-tracking, but the above are useful if you need something quick. I'm off to work on my perfect fourths. I told you I like your blog. I got the Versatile Blogger Award. Now I am passing it on to you!